Cypress Gardens closed in September 2009. It reopened as Legoland Florida in late 2011. While the park was redesigned to appeal to families with young children, it did retain some of Cypress Gardens' most popular features, including its lovely traditional gardens and a variation of its classic water ski show. You can read about it in my profile of Legoland Florida. The following information is about the closed Cypress Gardens. Cypress Gardens predated Disney World by many years. 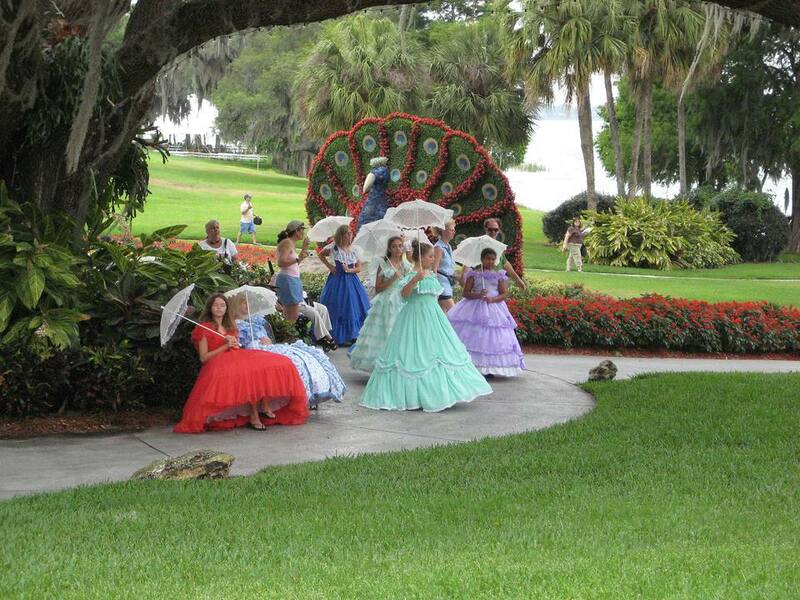 Its quaint mix of botanical gardens, Southern belles in hoop skirts, and water ski shows once made the park a Florida must-see. But Disney and other next-generation parks rendered Cypress Gardens a bit too quaint, and by 2003, it closed after years of dwindling attendance. The owners of Georgia's Wild Adventures came to the rescue, added the "Adventure Park" tagline, and introduced coasters and other amusement park staples into the mix. However, they declared bankruptcy. New owners eliminated the coasters and rides during the 2008 season. When I visited the park in 2006, the gardens themselves were truly stunning. Framed by majestic cypress trees that lined the banks of Lake Eloise, the sprawling and immaculate Botanical Gardens were bursting with color. Surprises loomed at every bend in the path: A ring of beautiful, yet faintly ominous, banyan trees provided a canopy of shade; impossibly beautiful, flowing flowerbeds converged at a white gazebo and cascaded down a hill. The Topiary Trail featured oversized whimsical creatures fashioned from hedges and plants. A butterfly conservatory, which sat at the entrance to the lovely, formal Plantation Gardens, offered a hushed sanctuary. The food was mostly uninspired, typical park fare. I wondered why the park didn't add some vegetable gardens to the grounds so that they could have prepared meals using the freshly picked crops. With its old-Florida heritage, perhaps Cypress Gardens should have also incorporated citrus into some dishes or at least featured citrus drinks. Winter Haven, Florida. About halfway between Orlando and Tampa, app. 60 minutes from both cities. Why are Some Amusement Parks Known as Trolley Parks?